In this article, we will develop an Android application that stores user touched locations of Google Maps in a remote MySQL server. 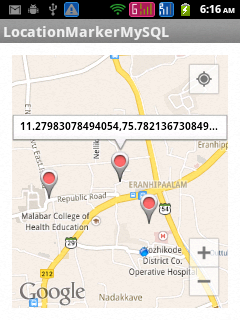 Since this application is developed using SupportMapFragment, it can support Android API version 8 and above. In order to send latitude and longitude from the application to the web server, we are using HTTPUrlConnection api in “POST” request method. This application is developed in Eclipse ( 4.2.0 ) with Android SDK ( 22.2.1 ) and ADT plugin ( 22.2.1 ) and is tested in Android API Level 2.3.6 and 4.1.2. Hello, How I can repeat AsyncTask to update the marker created manually in the database? thank you. Really this was very helpful and thank you very much. I have a question that I want to change the “title” and “snippet” of the marker other than the latitude and longitude. any answer replay me on my email. please follow the answer me,about how change the tittle. 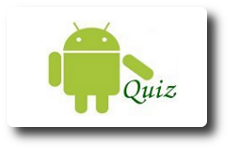 can you help tutorial google play services import for android API 19 4.4? hello, first thanks for your tutorial. it works on my device, but it only show the map with the blue dot that show my current position. i inserted data to database, i run the retrieve.php on browser and it works, it show data. but on my device, it didn’t show any marker at all. i change the URL also, but still didn’t show. nice tutorial but i want to get current location and send it to server by pressing button not by adding marker like in this good tutorials u mention please give me any idea to do this……. How are you & your family?I am ashwin. i already spoke to you regarding USB camera.but i have a small doubt in grid view. i want to get the position of the item in multiple selection using grid view. Actually i use “getselectedItemPostion” method but its not working. so i need a sample app for gridview with multipleselection and also while clicking item,just display the item positon of the selected item. if it is possible send it to me sir. thats a cool coding…. this important to my study…. tq alot master…. I was trying to do the same thing, you were able to do that?? Please, e-mail-me. I am trying to do the same, how could you give me the market a different title? Thanks for your help! GREAT TUTORIAL!!! Thank you ever so much for sharing. I just wanted to know how to put names instead of latitude and longitude, I mean, if I want to put a new marker, should appears the name like: “Church”. Hi George, could you please help me if i want to show infowindow showing the address and phone number retrieved from mysql database?Your help are really appreciated! I was really really helpful, Thank you very much from Paraguay.